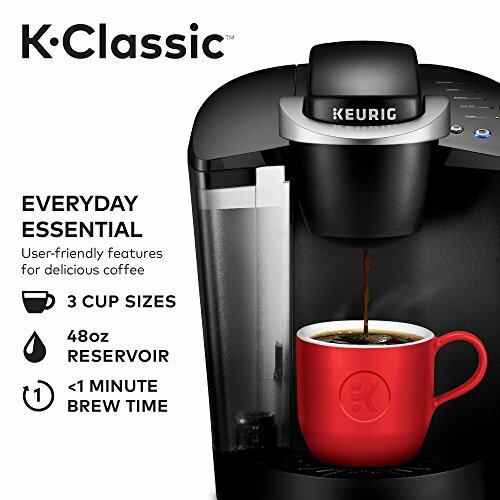 The Keurig K50 and K55 are part of the Keurig classic product line. These basic machines, which make consistent cups of coffee, are considered the most popular in the line. But there is some confusion about these two Keurig models – do they have any differences, or are they basically the same machine? Let’s take a look. What is the Difference Between Keurig K50c and K50b? Should You Buy One Of These Coffee Makers? While these machines have different names, they are essentially the same. The reason that the K50 was updated is because there were a few bugs. By giving the updated K55 improved internal features, such as quieter brewing technology and a slightly quicker brew time, they seemed to have fixed what made some K50 machines fail after only a short time. These machines have the same functionality and features. The K55 is a touch heavier as a result of those internal mechanical updates, but that’s the only real difference. Despite the update, Keurig still sells the much-loved K50. As if the whole K50 vs K55 thing weren’t confusing enough, we also have the K50c and K50b. Again, there are no real differences here as seen in our Keurig K55 review. After hours of research on these discontinued Keurig models, I don’t see anything that sets them apart. My guess is that it’s a difference in the model name due to slight variations in the internal components. The K50 comes in two colors – black and rhubarb (a nice deep red). The K55 comes in four colors – black, white, patriot blue and rhubarb. The blue and white are much harder to find and have to be specially ordered. The pros of the K55 are obvious, you have more options to choose from to match the décor of your kitchen. The K55 measures in at 13.3-inches high and 10.1-inches wide. It’s 13.2-inches deep. 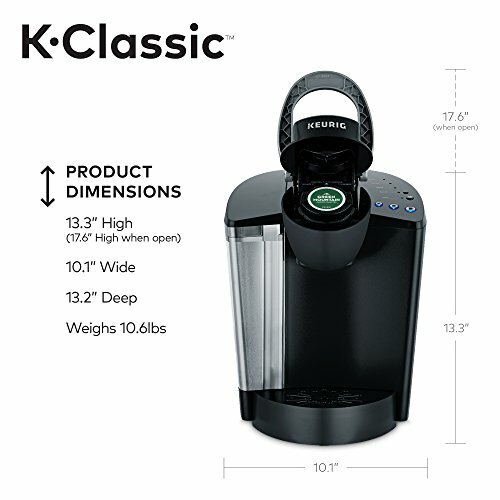 This is the exact same as the measurement that Keurig gives for the K50. Some sellers state that the K50 is larger, but I can’t find any hard evidence to back that up. I suspect that the box, which measures in at about 14x15x14-inches, confuses some internet shoppers. Either way, both these machines have a huge pro in that they are compact enough to fit on a countertop without taking up too much space. There is a difference in weight. The K50 weighs 10.6-pounds, while the K55 weighs closer to 12-pounds. Those extra two pounds are most likely the result of the internal upgrades that were installed in the K55. Not a big deal, since you don’t have to lift or move your coffee maker. The aesthetics of the K50 and K55 are nice, but not terribly modern. There’s no fancy lights or LCD display screen. This is one of the older designs in Keurig’s line-up, but it’s not unattractive or outdated. Both of these machines produce the exact same cup sizes: six-oz, eight-oz, and ten-oz. For most coffee drinkers, that is sufficient for the morning cup of joe. Some people may want larger cup sizes, like a 12 or 14-oz, to fill up a large travel coffee mug. Let’s first look at the technology. There is a set amount of coffee grounds in a K Cup Pod. Whether you choose a six-oz or ten-oz brew size, you have the same amount of coffee, so the larger brews are certainly less strong. Adding larger brew sizes to the machine would just result in very diluted coffee. If you want a larger portion of coffee, your best bet is to brew two pods and cycles into one large mug. That makes having larger cup size settings on the machine irrelevant. For other issues, see our Keurig troubleshooting guide. Both the K50 and K55 have a removable 48-ounce water filter. This is enough for four to six cups of coffee, depending on what size you brew. If you make two travel coffee mugs each morning, you’ll have to refill the water tank when you are done. But otherwise, the water tank can be filled every couple of days, which is convenient when you are in a rush. Does the K50 or K55 have a water filter? Yes, and yes. Both of these models utilize the Keurig charcoal filters. There are usually a couple of filters included when you purchase your machine. You should also get a water filter handle, which helps hold and change the filter. If you are putting in filtered water – which gives your coffee better flavor – I wouldn’t worry too much about the water filter. Neither of these machines feature any kind of programmable brews or display options. The operation is done entirely by push buttons. Since the controls are so simple and there aren’t brew options, e.g. temperature or strength, there aren’t really any settings that you could store in your machine. There’s no clock or display to speak of, but that works as a pro for both these machines, as it reduces lag time during heating and brewing. The only automatic/programmable feature is the auto off, which will shut down the machine after two hours of inactivity. You can use the button to turn this feature on and off. One of the systems updated in the K55 is the brewing technology. 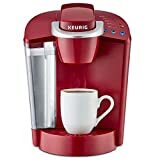 The K55 utilizes Keurig’s “quiet brew technology,” which makes a cup of coffee without the whole neighborhood hearing that signature Keurig whirr. Both machines require a couple of minutes to heat up prior to brewing. If you turn the machine on, you can have a cup of coffee in under a minute with the K55. The K50 clocks in at almost exactly one minute. Both machines can brew any K Cup Pod, Keurig Green Mountain brand or otherwise, and both accept refillable K cup pods. With this wide range of options, the K55 and K50 can brew it all – from cocoa and tea to coffees and cappuccinos. Both the K50 and K55 are solid choices for Keurig lovers. These machines are affordable and do most of what the fancy Keurig machines do. If you want a basic cup of coffee that is consistently good and convenient to make, then choose one of these models. They are ideal for couples or small families, since they have the bigger reservoir. One thing to be aware of is that Keurig is renaming both of these models. 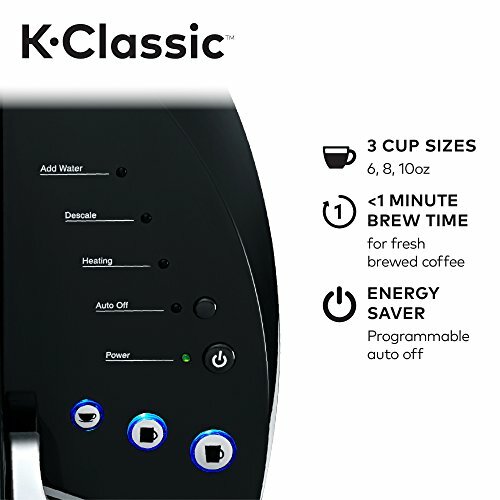 Keurig now offers the K Classic machine, which has previously been known as the K45, K50, and K55 brewer. That’s why it’s now so hard to find the K50 and K55, particularly in certain colors. If you aren’t a Keurig user already, consider the weaker flavor of the coffee produced by these machines. Also, look at the controversial environmental impact of using K Cups. Not a deal breaker for most, but something to be aware of if you are switching from a drip coffee maker. It can be hard to choose between the Keurig K50 and Keurig K55. These machines have essentially the same features and functionality. 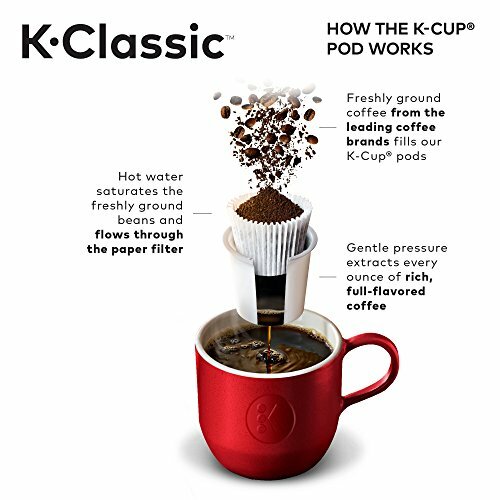 Given the K50’s history of breaking and Keurig’s need to update the inner workings when creating the K55, I think the K55 has the winning edge. The K55 is versatile, reliable, and updated. It’s affordable, user friendly and brews basic coffees, teas and cocoas in any brand of K cup, even the refillable K cup. It works more quickly and quietly than the K50 and has a compact design and two extra color options to fit any preference. The K55 is perfect for those who need convenience and consistency.